After an early breakfast in Hemingway’s room at the Ritz, Ernest and Mary headed toward the Luxembourg Gardens where they enjoyed listened to a French military band play a selection from Carmen. Then, after a coffee in the small café under the plain trees, they headed for the rue de Fleurus, which connects with the rue Guynemer that borders the western side of the gardens. Half way up the rue de Fleurus, on the left hand side, is number 27, and here Ernest and Mary stopped and rang the bell of Gertrude Stein’s apartment. There was no answer. They tried again. Still no answer. After a while an elderly lady came out of a small dress shop opposite and told them that Miss Stein and Miss Toklas, having endured the hard years of German occupation, had, on a whim so to speak, taken a small house in the country, but where she did not know. Ernest and Mary made their way back across the Luxembourg Gardens, past the gallery, and, after two left turns and a right, down to her bookshop, Shakespeare & Company, at 12, rue de I’Odéon. After looking in the window for a moment or two, they stepped inside. Sylvia Beach was sitting at her desk reading; she didn’t look up. “ Yes, what can I do for you?” she asked. “ Do you have any books by Ernest Hemingway?” asked a smiling Ernest. Sylvia Beach ran from behind her desk like a schoolgirl greeting a long lost and much loved younger brother, flinging her arms about Ernest’s neck and kissing him repeatedly on both cheeks. The words came thick and fast now. Hemingway enveloped Sylvia in a huge hug, lifting her clear off the ground until she squealed for mercy. Sylvia Beach looked Mary up and down. Sylvia Beach was born Nancy Woodbridge Beach, on the 14th March 1887, in the smart New Jersey town of Bridgeton. Her father was a Presbyterian pastor who took his family on a visit to Paris in 1901, where Sylvia fell in love with the city at once. With the outbreak of the First World War, in 1914, Sylvia moved back to Europe and became a Red Cross nurse in Serbia, where she met her partner and lover, Adrienne Monnier. 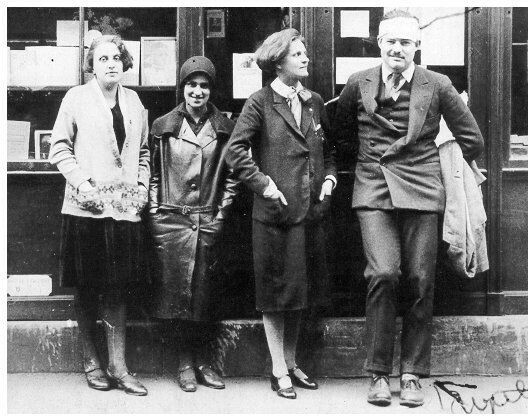 After two years with the Red Cross, Sylvia and Adrienne moved to Paris in 1916 and founded Shakespeare & Company in the rue de I’Odéon. The shop immediately became a focus for ex-pat American, British and Irish authors. In 1922, as she told the German soldier, Sylvia published James Joyce’s Ulysses — Hemingway helped Joyce with the final drafts — to both acclaim and ridicule. With the coming of the depression Sylvia found times hard, and it was only with the generous help of the English writer Bryher (otherwise known as Annie Winifred Ellerman, Robert McAlmon’s wife, and the lover of the poet Hilda Doolittle), that the shop stayed in business. Hemingway made his first visit to Shakespeare & Company soon after arriving in Paris, but decided not to show Sylvia his letter of introduction from novelist, Sherwood Anderson, but instead asked her what books he should read. Sylvia suggested he start with Turgenev, and then move on to D.H. Lawrence, which he did. He actually bought books too, which was a rarity in such a philanthropic organization as Shakespeare & Company. With the German closure of Shakespeare & Company, Sylvia, Adrienne, Gertrude Stein, and her lover, Alice B. Toklas, became instrumental in helping hundreds of Jewish refugees escape to Britain. In 1951 George Whitman (who claimed to be Walt Whitman’s grandson) set up his bookshop, which he called Le Mistral, at 37 rue de la Bucherie, which quickly became the home of another set of ex-pat British and American writers, such as Lawrence Durrell — an old friend of Henry Miller — and the beat poet Alan Ginsberg, and novelist William Burroughs, who used to read their work out loud on the pavement outside Whitman’s shop. By the mid 1950s Sylvia Beach had had enough and gave up the business, allowing Whitman to use the name Shakespeare & Company. Sylvia Beach died in 1962; and there can be no doubt that Beach’s shop, and her kindness and friendship to so many aspiring writers in the 1920s was pivotal in helping to shape the future of 20th century literature. then added milk, far too much milk, and sugar. What Hemingway and Mary drank was a warm, sweet beverage that bore little or no relationship to the delicious anticipation of its earlier aroma. Hemingway could find no answer. He just looked at Sylvia Beach as if she were a stranger, and not the gifted, generous woman who had helped him to become a writer. She was right though, he thought, she was right. “ Do you still have that copy of Winner Take Nothing, Miss Beach?” he asked. Sylvia left the room to return just a few seconds later with a slim volume she handed to Hemingway. Hemingway read from the flyleaf of the book. He was probably not referring to the tea. accusing her of disloyalty. Mary started to challenge Hemingway but stopped as soon as she saw his dark far away eyes. Note: Although based on fact I have used a certain amount of creative licence.